My title isn’t really what Dr. Turley says. He’s quite hopeful that Farage is going to come in and team up with UKIP, the party he left in a huff, and together they will sweep Brexit to the finish line. I hope Britons aren’t taken in by their version of Joe Biden, OE –Opportunist Extraordinaire. Come to think of it, except for his accent, Mr. Farage would fit right in with all of DimBulb crazies here who are terrified of nationalists, populists, and assorted folk to the right. Ol’ Nigel wants to have his cake and eat Batten’s share, too. […] Mr Farage told BBC Radio 4’s Today programme: “In terms of policy, there’s no difference (to UKIP), but in terms of personnel there is a vast difference. Deeply intolerant of intolerance, eh? That makes you intolerant, dude, and so “tarnished” you’d need a gallon of Brasso to clean up tolerably. Hie thee to a Logic class forthwith, Mr. Almost-All-Things-To-A-Select Few. I’ll bet Farage makes a hex sign when he sees an image of Tommy Robinson, who is twice the man this flibbertigibbet could ever be. The videos were clear, as was the evidence presented by Luton police intel that Tommy Robinson was not a risk. So what. The Alice-in-Wonderland judge found for the police anyway, and Tommy has to pay their costs. Actually, he’s paying for being an enemy of the state of Soviet Britain. What a travesty. Dollars to doughnuts, the mendacious MSM in Britain will be all over this. Ezra Levant says the lawyers for each side have to give their summaries in the coming day(s) before the judge can rule. Tommy says all he wants is an apology for the out-of-line bully-boy (my words) behavior of the police. But they are stiff-necked and can’t apologize to a chav. Not a chance. Ezra has to return to Canada so he won’t be present for the remaining (two?) days of the hearing. However, once this thing is over and done, he plans to put back up the tweets he had to delete after this judge put the kibosh on his efforts. Surreal Soviet Judiciary in the U.K.
What chance do regular working-class Brits have when their tongues are cut out by their betters? I pray Ezra makes it back to Canada in one piece and on time. Evidently, he scared those itty bitty policemen. Never was I so glad to be an American. Ezra Levant flew to England to report on the charges Tommy brought against the police for their persecution of him and his family. They planned this because neither of them believed the British press would cover it. Nor did I. Is there even a conservative press of any magnitude left in Britain? And here is Tommy’s take on the course he is pursuing because of what the police did to him and his children while he was in a pub after a football game. You’ll notice that when he is forced to leave this restaurant, he has to walk a bit to get to a stairway which leads eventually to the street – my point being that the Cambridgeshire police had to hunt him down; he wasn’t being public about his afternoon with his kids. 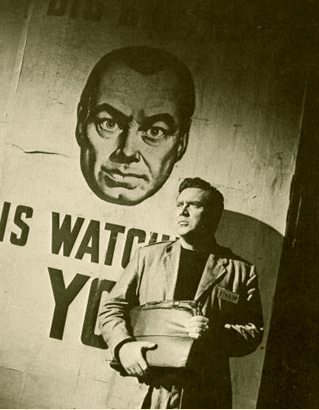 Tommy had done nothing wrong, but if the government decides you’re the enemy then they send their minions after you. This is one reason for my sadness at the low point to which the U.K. has fallen. When push comes to shove, the police aren’t going to give up their cushy jobs and pensions. Instead, they’ll bloody the heads they’re ordered to smash and dismiss the disaffected as “extremist trouble-makers”. For those of us in the U.S., this mindset and behavior are similar to the attacks on well-known people on the Right by our entitled social justice warriors. But at least we are not as isolated and alone as British cultural defenders like Tommy. Here’s Tommy’s page, with a link to donate to the cause. The MSM is saying he has lots of money, leaving you to infer he doesn’t need your help. Or so claims the disgusting BBC. Here’s one of the few dissenters, Gerard Batten. Do watch, it’s very brief. But the important thing is the events Batten reveals, the amazing amounts of persecution and corruption being brought to bear on one man. A reminder: during this penitential season of Lent, please keep Tommy and his family in your prayers. In the U.S., this kind of vengeful harassment is carried out by the deep state (FBI, etc.) or by socialists against Trump supporters. In the U.K., the police have taken over the job. The despicable soviet hellhole once renowned for its creation of the Common Law is setting up the martyrdom of Tommy Robinson. Tommy’s plight is limned in the outlines where once stood a now-vanquished Justice. She has taken her scales and fled the blighted land that he chose to stand and defend, not knowing ahead of time that she would be forced to flee. Their persecution is truly diabolical. First he is assured that his broadcast is legal, then after several hours they say he’s broken the law after all; a kangaroo court sentences him to prison. Once behind bars and thinking he can survive this one, they suddenly move him to a far more dangerous place and then put him in solitary confinement for his own “safety”. Not so solitary that he can’t be spit on or have feces shoved into his cell. But solitary enough that visits even from his lawyer become problematic. They’re hoping to break Tommy to the point where he’ll kill himself. You can tell from his agitation in this video that he hasn’t recovered from his previous persecution. This new blindsiding is designed to weaken him further. You can contribute to his fund here. In this penitential season of Lent (which began on Wednesday), I would ask also that any of our readers who are so inclined to pray for Tommy and his family. And please remember in your prayers the thousands of English children and their families whose lives have been smashed and maimed by Pakistani barbarians. Those pedophiles were permitted to flourish by the very same ruling class that wants Tommy dead. I accessed your page twice in the course of putting up a post to link to your donations. When I tried a third time, I was blocked. I tried clearing cookies, but still no luck. Is this a security measure? I’ll have to find another way to get the money to your fund. 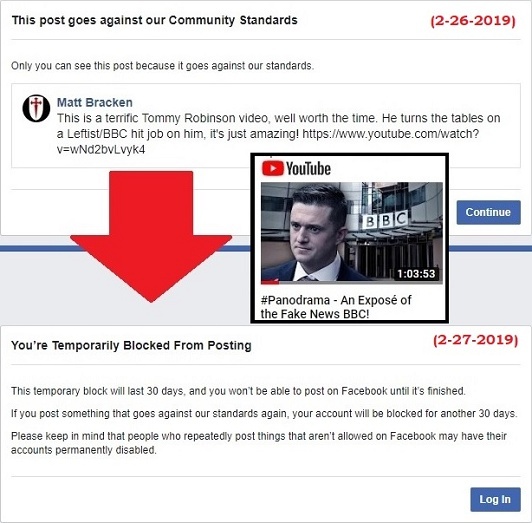 If you want to retain your posting privileges on Facebook, you’d better not link to any videos by Tommy Robinson. And don’t post any photos of him. Make sure you don’t like anything by him. And don’t even mention his name, except to tell all your “friends” that he’s a horrible racist and fascist and you hope he gets his face gnawed away by tapirs. On February 27, I posted the YouTube link to Tommy Robinson’s powerful new documentary “Panodrama” on Facebook. (If you have not seen it yet, I cannot recommend it highly enough.) Shortly after the video’s release, Tommy Robinson’s account was deleted by Facebook and Instagram. Tommy had already been banned from Twitter for his earlier thought crimes. Taking their PC restrictions a major step further, Facebook is now banning or suspending anyone who posts supportive links or messages about banned thought-criminals. In my case, this means I am now on my eighth 30-day suspension from Facebook in the past year and a half. I was already permanently banned from Twitter for posting an anti-burka meme that did not even mention any religion. 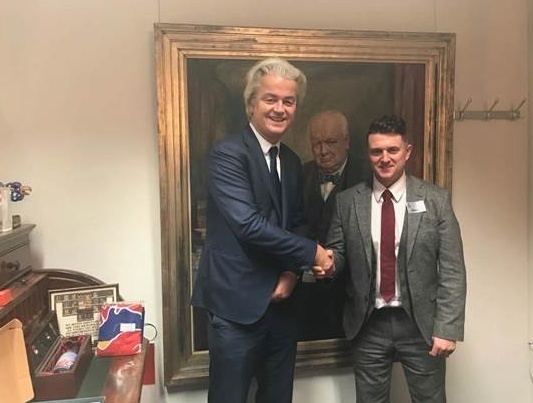 On December 17 Geert Wilders, the leader of the Party for Freedom (Partij voor de Vrijheid, PVV) in the Netherlands, invited Tommy Robinson to the Dutch parliament and gave him a tour. Without your support there is absolutely no way we could have made a success of our Brexit rally last week; how grateful I am for your belief and commitment to these movements goes far beyond what words can describe. I was overwhelmed by the genuine heartfelt passion shown for both the issue at hand and the country as a whole. We can all hold our heads high in that we achieved what we set out to do, which is send a stark message to our government that we are watching their every move and we will not allow our democratic rights and freedoms to be dismissed! We can also revel in the fact that the mainstream media and the establishment are scared. They have been out in force to somehow portray people demonstrating one of the biggest betrayals in British democracy as extreme!?! Yes, it does get boring being constantly labelled; however, the mainstream media continually persist in shooting themselves in the foot. Every mainstream media outlet published that only 1,500 to 2,000 turned up but in the world of social media we continually expose them as blatant LIARS again and again!! Here’s a video explaining the Remainers’ views. Notice they were the ones who got violent. There is a three four-hour streaming video on RT, but our less-than-broadband connection is weighted down by snow [pictures at 11:00, provided I can nag persuade the Baron into taking a few snapshots. Right now the visibility is less than a quarter of a mile]. This, our first real snowfall of the season, serendipitously closes out our Quarterly Fundraiser. It’s quite beautiful if you don’t have to go out in it. If y’all find any good videos on the rally, please leave them in the comments.